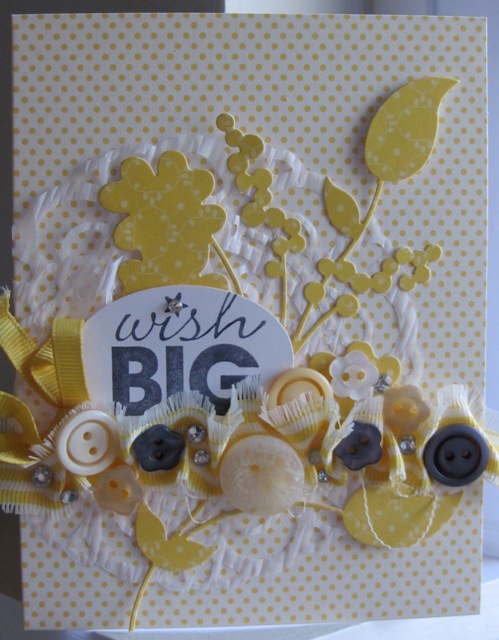 For this, I have to say "stunning," card I used a Daffodil card from the Simply Sent Create and Keep kit and one of the flowers from the pack as well. 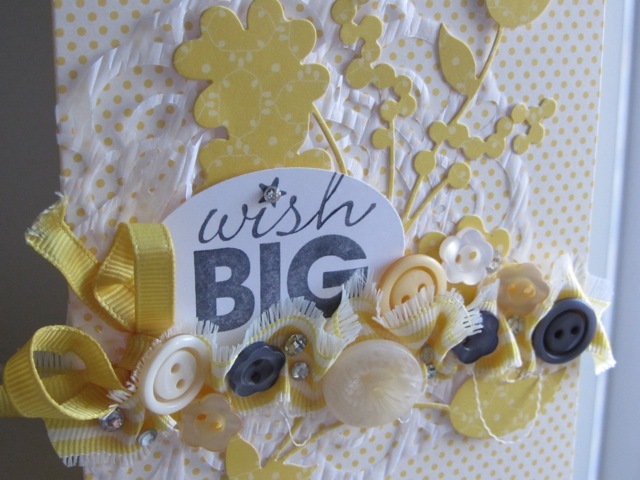 This is a one of a kind card because there is only one of these large and super beautiful flowers in the set. The whole kit is awesome and lots of fun with which to work. I must say that I am super drawn to this refreshing and clean color combo of Daffodil and Gray--yum! The added texture behind the main flower is a doily cut from White Waffle Paper. This doily is uber delicate, but oh so purty and as I said before textural. I had some fun snipping up some Daffodil Delight Striped Grosgrain Ribbon, ruffling it up, and tucking buttons and rhinestones in the folds. ...I love challenges! They get the creative juices flowing and move me in a direction I wouldn't normally take. 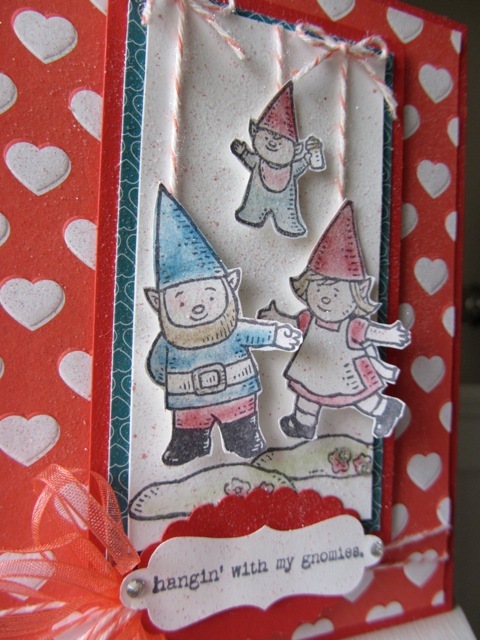 This sketch challenge, by the way of all the types of challenges sketch challenges are my favorite, made my think to pull out my stamp set called Gnome Sweet Gnome. This style stamp set is a total departure for my usual vintage, shabby, grungy style, but I like it. I need to do more to open my horizons. 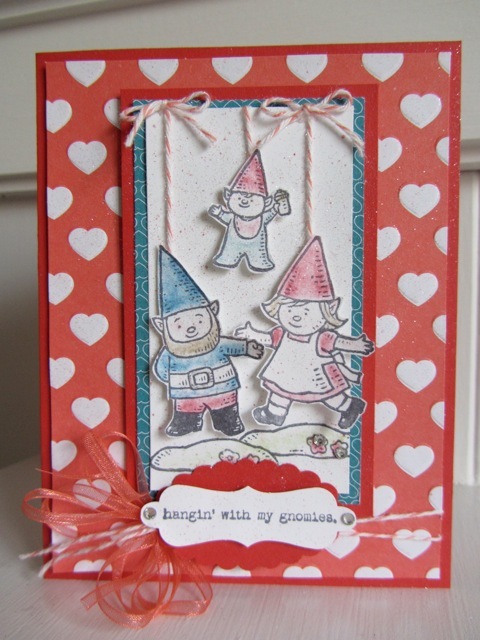 The greeting comes from a set designed to complement the gnome set and it's called Gnomenclature (I love a good pun). The sketch has been designed by LeAnne over at the Paper Players. I think you should all join along and add to the sketch. Enjoy you day and come again tomorrow for another challenge! Really, I do get a kick out of sketch challenges. I guess it's because it takes a smidge of the thinkin' out of the equation. 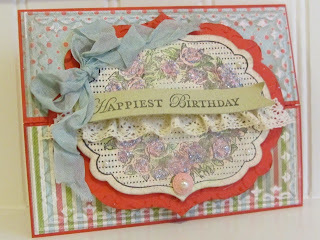 This challenge that was designed for the subscribers over at Create with Connie and Mary is a fantabulous one! My eye is drawn to this layout mostly because I like the weight of the one panel set at a right justification and then it's balanced with detailing to the left--so cool! For my card I have used lots of vintage styled products from the Occasions Mini Catalog. 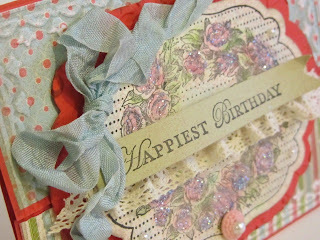 I used: Apothecary Art stamps, Attic Boutique DSP, Attic Boutique Side Notes, Lables Collection Framelits, the Large Doily Sizzlet Die, Pleated Ribbon, and Blushing Bride Smooch Spritz. 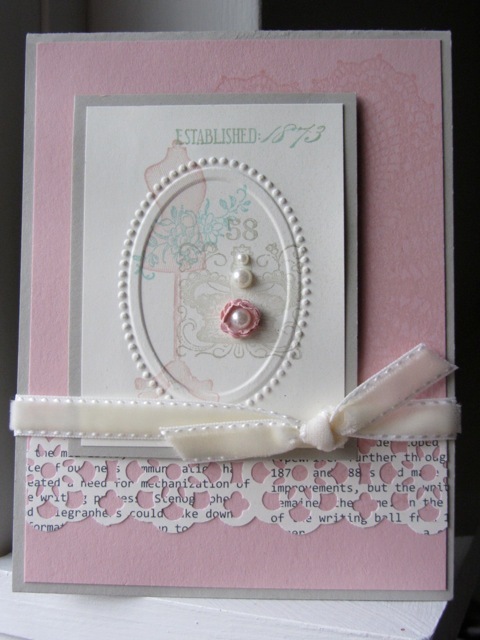 From the Idea Book and Catalog I used: Antique Brads, Itty Bitty Punch Pack, Triple Blossom Punch, Lace Border Punch, Paper Daisies, and Basic Pearls. I thought I would share a card from a workshop a few weeks back. I just love the soft soothing colors and the blends of texture. Today I am posting something a bit different. I was surfing around to some of my bookmarked blogs and while looking for a sketch or color challenge to play along with and I found a "design team call." Over at the Paper Players Blog they are in search of designers for the next three months. How fun would that be? Super fun! 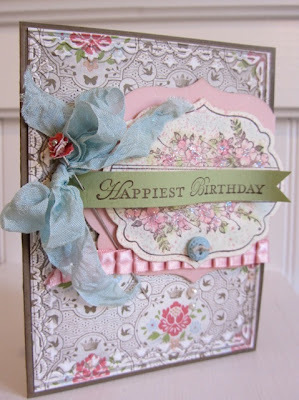 Color, sketch, and theme challenges play a major role in my passion for paper craftin'. They are great motivators, they spark and ignite my imagination, and inspire me to stamp, layout, and embellish in a whole new direction. Being a part of a weekly challenge team would be a total boost to my creative mode. In turn I would hope to spur the innovations of others and cheer on their works of art accomplishments! 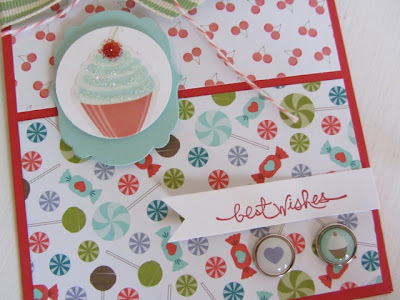 Pop over to this post to get the scoop on my favorite Christmas card from 2011. 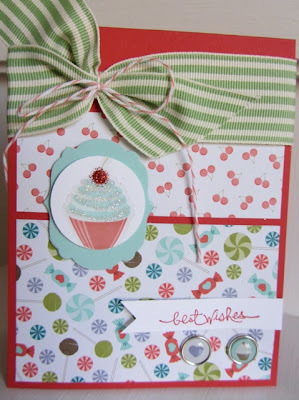 This card is chuck full of some of my favorite stampin' goodies. I started with a 5 1/2" x 8 1/2" Poppy Parade piece of card stock. 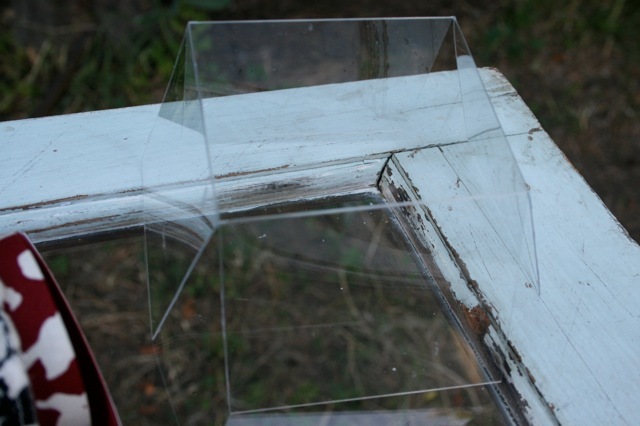 I scored at 2 1/8" then turned the card 180 degrees and scored at 2 1/8" again to create the gate fold. 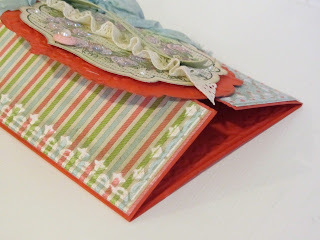 Then I added two pieces of Everyday Enchantment DSP, one to each of the front folds. Next I inked up the Framed Tulips Embossing Folder with Crumb Cake ink and ran the full thickness of the card through my Big Shot. I went slow because it was a bit tight and I didn't want to strip the gears of my most used tool of all, my Big Shot. A quick sanding to the top of the embossed areas and the background was complete. 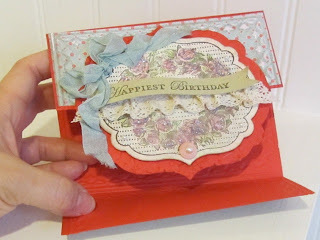 The focal of the card is the largest stamp from the Apothecary Art set which I colored with Stampin' Pastels and then toned them down by lightly sponging with Crumb Cake ink. The piece was cut out using the Labels Collection Framelits and backed with another layer of Poppy Parade cut with the next size up of the Labels Collection. 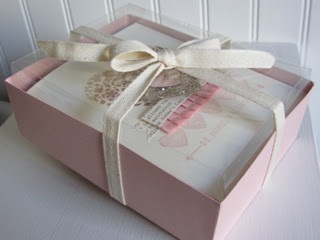 The greeting is also from Apothecary Art and I decided to accentuate it with a ruffle of Victoria Crochet Ribbon. 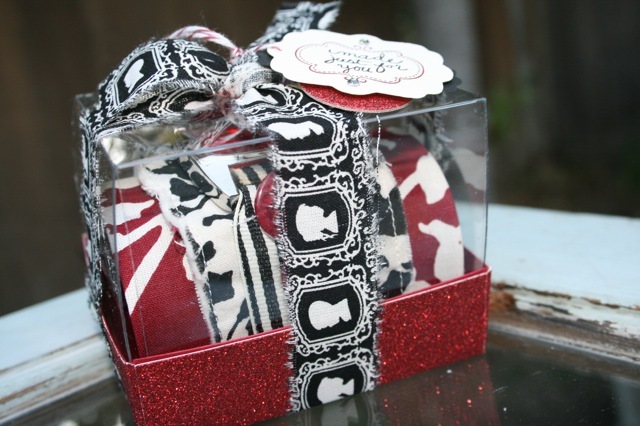 I included a Pool Party Seam Binding bow and a few bits of pearls and a Twitterpated Designer Button. 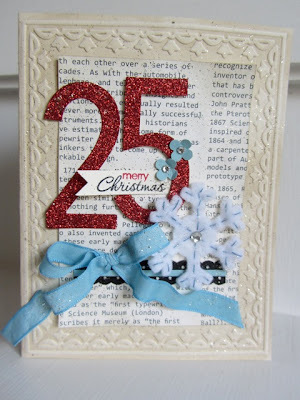 A spritz of cheap hair spray and a sprinkle of Dazzling Diamonds Glitter adds just a bit a sparkle to finish the card. Welcome to another Saturday Challenge hosted by Connie and Mary. 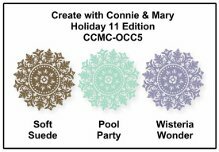 Pop over to Create with Connie and Mary to see more fabulous cards using this fun mix of colors: Wisteria Wonder, Soft Suede, and Pool Party. I started the base of my card with a 1/2 sheet of Pool Party card stock. 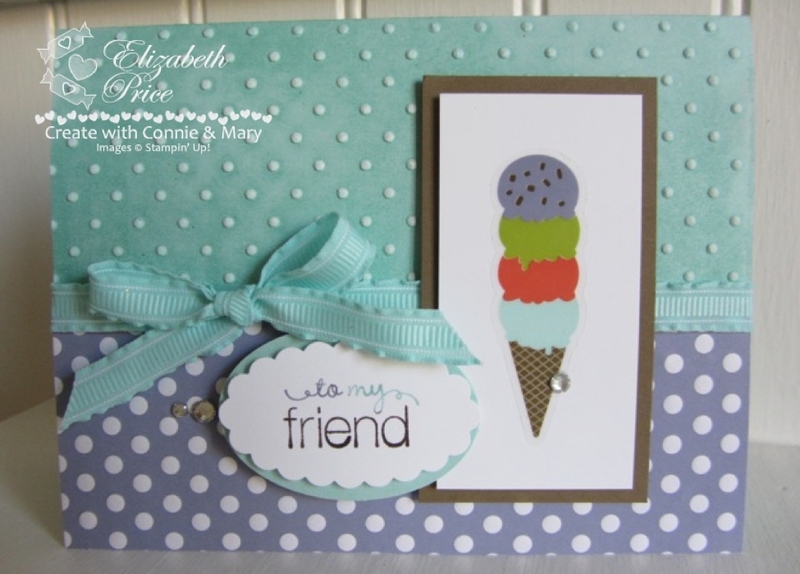 Using Pool Party Classic Ink I inked up the Perfect Polka Dots Embossing Folder and then I ran my card stock through the Big Shot. 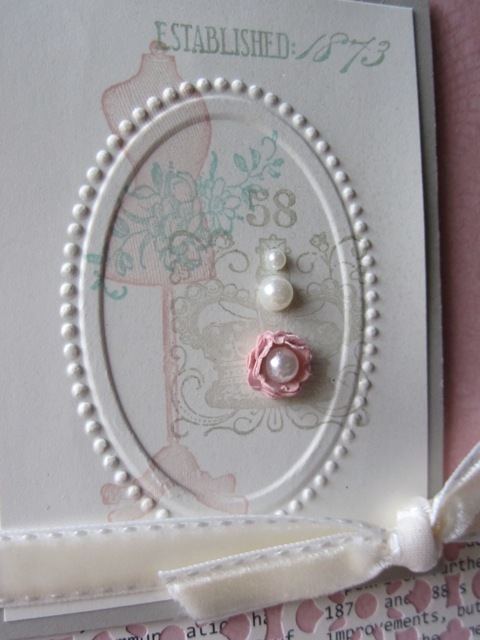 For just a bit more definition I rubbed the embossed dots with a Whisper White Craft Ink Pad. The bottom strip of paper is embossed as well. It's from the Sweet Shop Specialty Designer Series Paper collection. The focal point of my card is a clear sticker from the Sweet Shop Product Suite in the Occasions Mini Catalog. 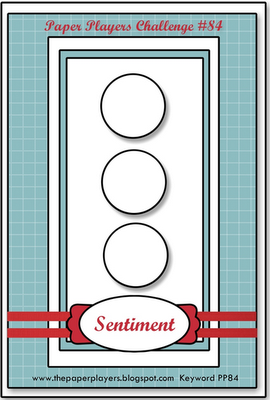 These stickers are fast and fabulous for adding to cards. The greeting comes from a FANTASTIC stamp set called Friendly Phrases. Funny thing is I kept wanting to use this set and thought I really should get that, but I kept forgetting to add it to an order. I am glad I did forget 'cause guess what? I already had it! It's a great set and if you don't have it--give me a call I'll get one ordered for you ;0) To finish I added a ruffled ribbon bow and some Basic Rhinestone bits o' bling. P.S. 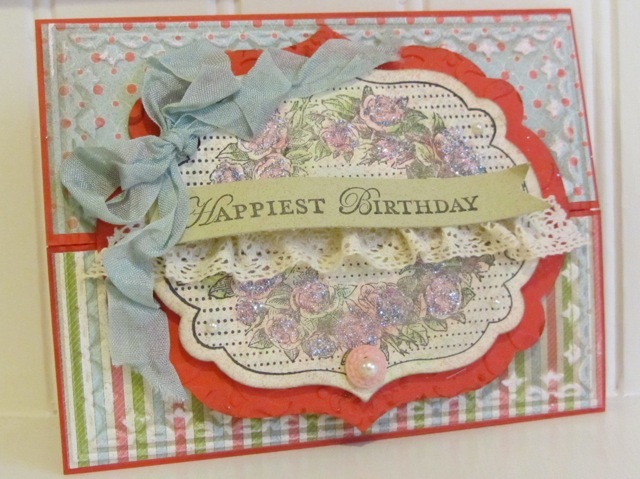 Next week over at Create with Connie and Mary we are featuring the Attic Boutique Product Suite and vintage goodies. The projects and tutorials are going to be incredible. It's not too late to join. You will get to see these and all the past five weeks of project tutorials. 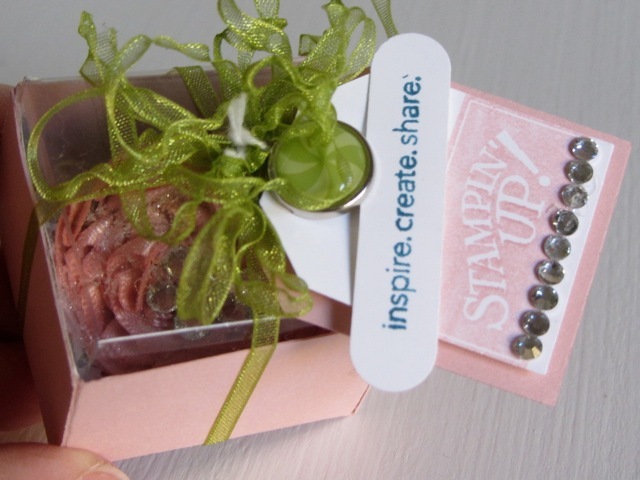 A total of 36, that's right 36 unique and never before seen ideas showcasing the Occasions Mini Catalog products. Yes, that's right this card whipped up nice and simple for two reasons. One, I cased one of my own layouts and two, I used a clear Sweet Shop Designer Sticker. Oh they are so cool and they are all of yummy treats like candy (yum), pie (yum), sundaes (yum), cake (yum), and did I say candy (yes, but another yum). For the cupcake I added a squirt of Cherry Cobbler Dazzling Details to the cherry on the cupcake and clear Dazzling Details to the frosting. The greeting is accentuated with Jelly Bean Brads also from the same Sweet Shop Suite. 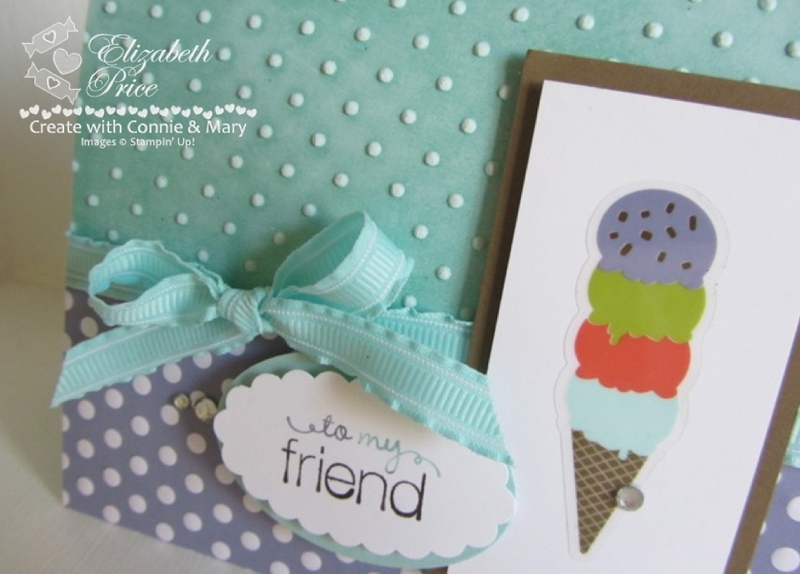 This week at Create with Connie and Mary we are featuring the Sweet Shop product suite and the projects are super mouthwatering. You too can join the Edition and get all 36 step by step tutorials of never before seen projects. Mine design for this week is totally innovative and functional, but you can't see it here. 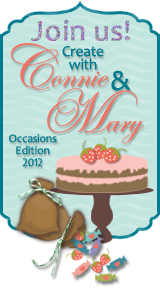 You have to join Create with Connie and Mary--you'll love it. 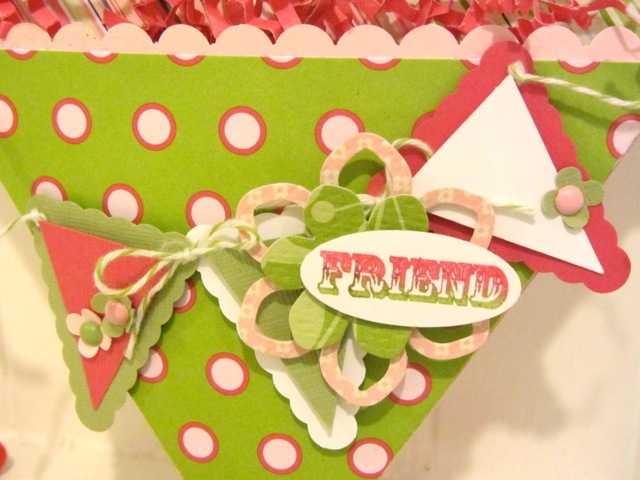 Hello paper craft enthusiasts, welcome to my blog! 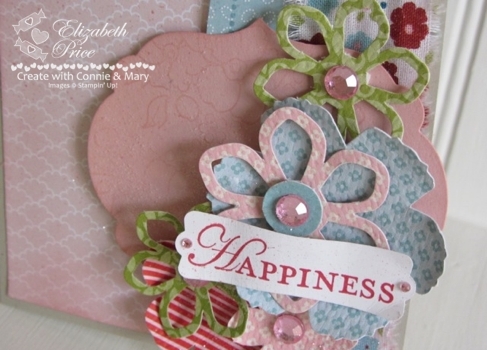 Happy Saturday and theme challenge goers from Create with Connie and Mary! 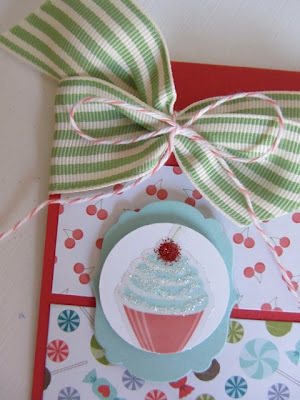 This weekend's challenge is to create a "simple treat for someone sweet." I seem to be getting Spring fever as I am beginning to think in soft fresh colors, I see blooming branches (yes, lots in San Jose), and I want to stamp and make flowers and everything new like baby birds and chicks. 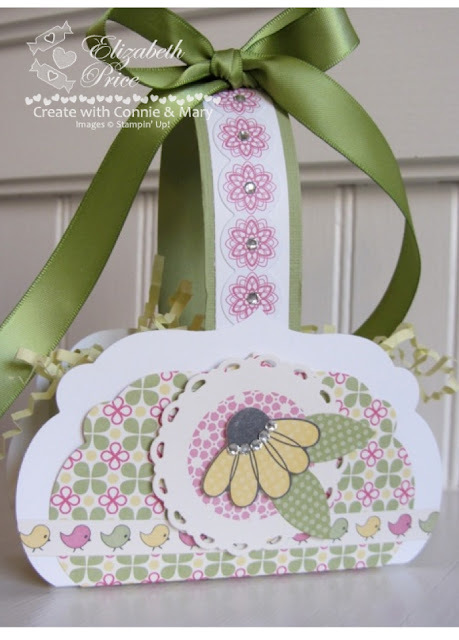 This cute baby sized basket is made using the new Simply Scrappin' kit found in the Occasions Mini Catalog, the Box #2 Bigz XL Die, and the Labels Collection Framelits. The tools make it a piece of cake to make. 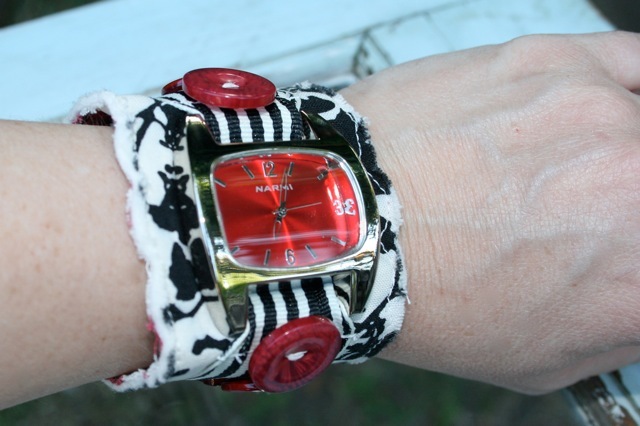 I will share that this watch was made as a sample for Stampin' Up! 's convention last summer. It is made using the Timeless Portrait Designer Fabric and the Table Setting Bigz XL Die (now retired, but so totally awesome). 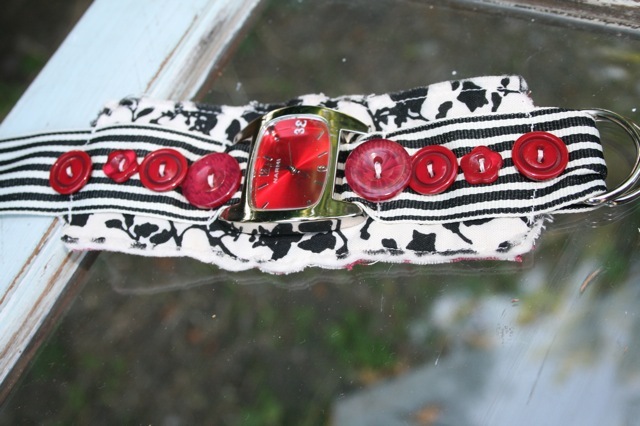 I cut two layers of the fabric and one layer of wool felt to make the wrist band of the watch. The watch face and D rings were purchased at Joann's. 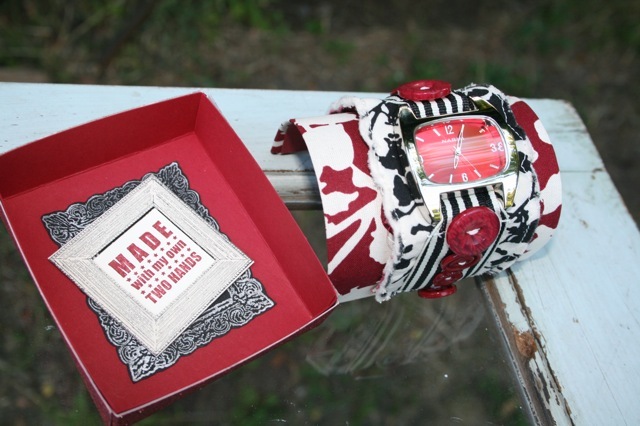 I package the watch on a fabric covered piece of lightweight cardboard which I placed in a box bottom made form Red Glimmer Paper and stamped with images from Creatively Yours and Frame It. 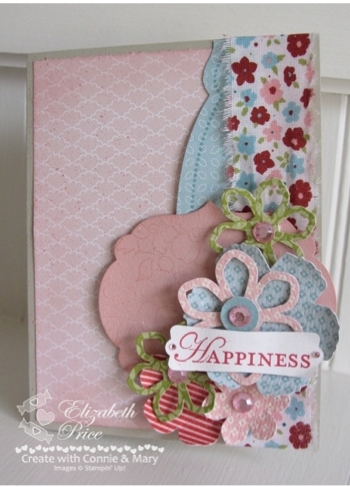 Using the Petal Cone Bigz L Die this cute pocket was made from the Cheerful Treat DSP. It's cute and the pocket is just the right size for little candy or a great gift card to give to a friend for Valentine's Day. For this pocket the DSP has been lined with Pink Pirouette card stock. It gives lots of nice stability. The flower was made by layering a couple of the pieces from the Blossom Builders pack. And the simple two-toned greeting is from a stamp set called Family Reunion. 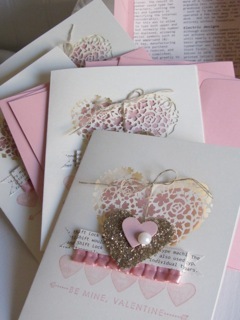 For more Valentine ideas click over to Shirley's Blog Hop. In fact it would be really cool if you would join along. 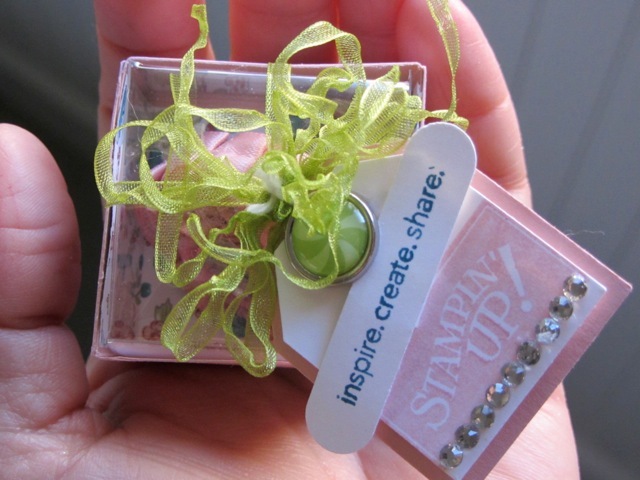 It's fun and you can make some online stampin' friends :0) I'll be looking for your link! 1. 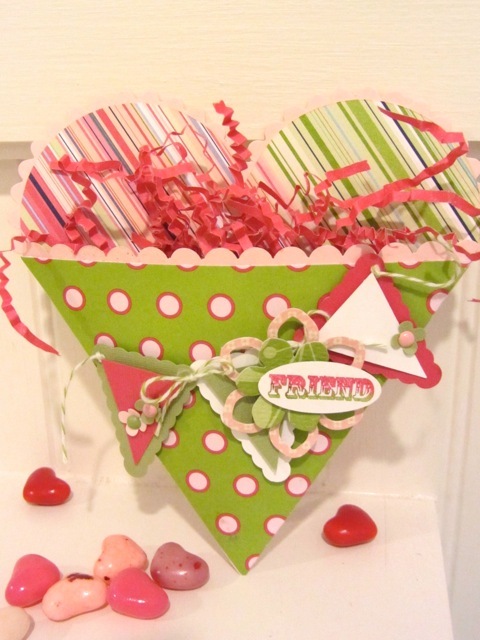 Anything goes card or 3D project it just has to be Valentines. 3. 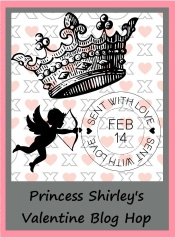 Add Shirley's badge to post with a link to her blog. I really REALLY like sketch challenges. They totally move me out of my typical layouts and into a grove I would not even think of. 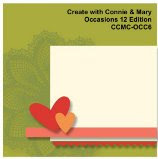 This sketch for Create With Connie and Mary is a super cool one. You can go to the Connie and Mary site to see more cards designed using this sketch. You can also join the sketch challenge if you are a subscriber to the Occasions Edition. Not a member? It's not too late to join. Check out this ribbon rose cocktail ring. 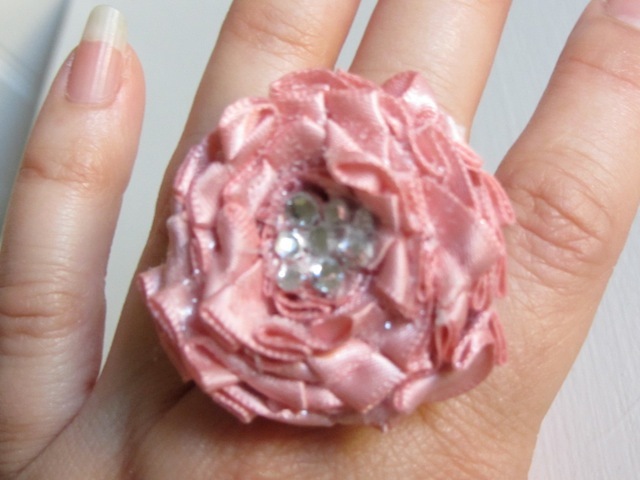 I made it by simply turning and twisting the Blushing Bride Pleated Satin around itself on soda cap ring base. I used a hot glue gun to hold the ribbon in place and in just a few minutes I was done. 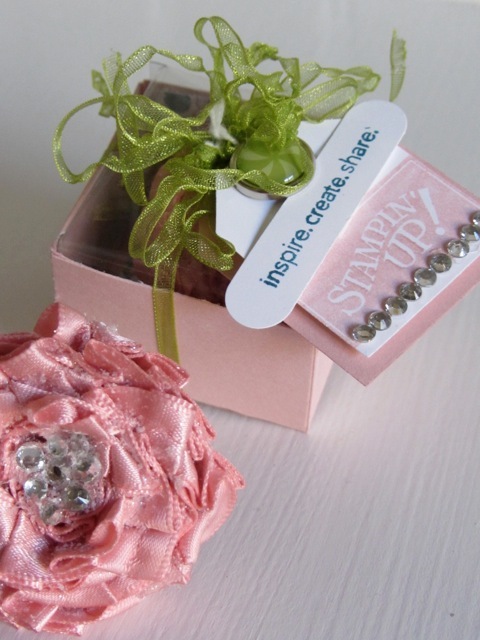 Because I gave it as a gift to my fabulous upline I had to make a custom box in which to wrap the ring. 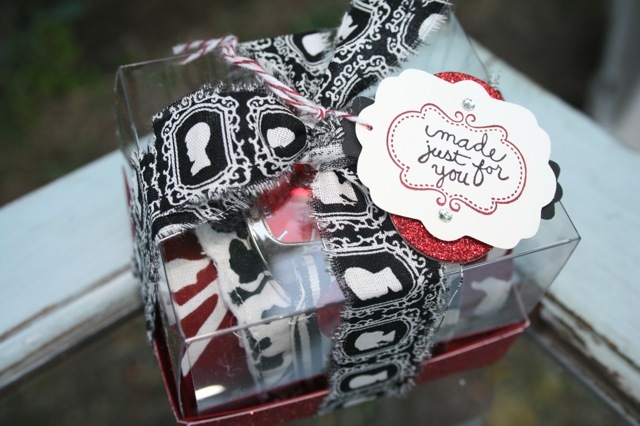 I tied the tiny box with a loopy bow and a fun tag. 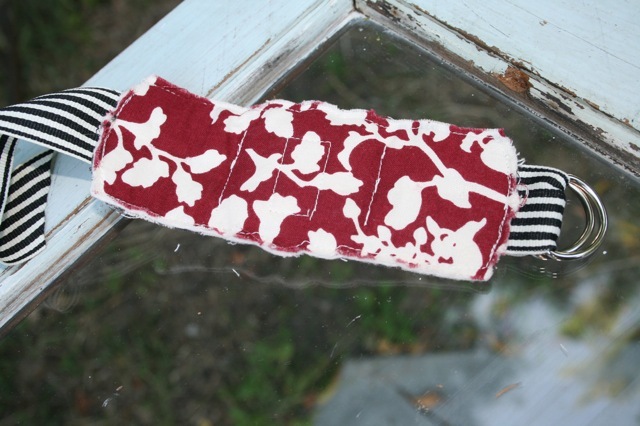 For extra added texture and interest I melted the organdy ribbon with my heat tool. I wanted to show how small and cute the box was. Look close and you can see the box was lined with Twitterpated DSP.